Walter Goldenits, Chief Technology and IT Officer at Magyar Telekom, left Hungary at the end of December after spending four years here, in order to continue his career in the same position for Deutsche Telekom in Germany. In this farewell interview he draws an account of his time spent in Hungary and presents an overview of the future of his branch. During the four years you spent here, which were the most important milestones in the history of Magyar Telekom? We invested intensively in the fixed network and in mobile technology allowing the conversion to 4G. We managed to accelerate the expansion of the fixed network to such an extent in spring 2015 that within two years one million more households were able to use broadband. Another important milestone was reached in autumn 2014 in network coverage by mobile radio, when we started to use the frequencies acquired at the frequency tenders, and we were able to increase 4G coverage in the countryside from 54% to 73% in one single day. So there is still demand for the fixed network? We have ten times as much data traffic through fixed network as via the mobile network, not even taking TV into account. The mobile network is not capable of carrying such a data mass right now. We are convinced that both networks are important and they complement each other well. Since September we have a new home router on the market for example, which combines fixed and mobile network speed. This means that when you use your mobile phone at home, it connects to the WiFi, which combines the data traffic over the fixed and the 4G mobile network, reaching a higher bandwidth in total. Basically the two bandwidths are added up allowing a faster Internet access as if you would be surfing only through the mobile or fixed network. In the future we are planning to further develop both: the fixed and the mobile network. What’s the situation in terms of coverage right now? We have equipped almost 2.7 million households with fast and good-quality, so called high-speed internet access in terms of fixed network development. This makes out about 80% of our total fixed network, however the important news is that there will be another expansion before 2018 and this number will be growing further. Considering mobile coverage, we cover 98% of the countryside with 4G and we will be growing further in that direction too. For 2017 we are planning to cover 2600 villages with less than 6000 inhabitants. That will allow us to reach about 99% coverage. How is Hungary doing in the international league? As for the 4G network, Hungary has the third-fastest mobile network in the world according to an OpenSignal report from September 2016. Hungary reached a level in terms of 4G where it can absolutely keep up with the top countries in the world. In this context we are not lagging behind the others at all. And what is happening with the 4G+ network? 4G+ is a further developed version of 4G, where several frequencies are combined to reach a higher speed. 4G+ brings more capacity and more speed into the network. This is essential, since the data traffic is growing exponentially. High-speed data traffic will change the economy and bring forward new business models. In the media branch the transmission over 4G can make sense. It’s also amazing how fast the young generation is adapting to this technology. This is why we need 4G+, in order to be able to offer an excellent service. And then there is 5G. What is the actual difference between 4G and 5G? 5G is a whole new standard, where the main difference is latency time, meaning the time spent between pushing the button and the reaction. This reaction time takes about 30 milliseconds over the 4G network. This is too slow for certain applications such as virtual operations on the human body or steering of vehicles. You need real-time control for that. This will be possible with 5G. That opens up whole new fields of application. For example, the remote diagnosis of line masts via drones and in general the Internet of things (IoT). You will also see how fast the industry and other sectors, such as the health industry, will be using the new possibilities. The issue of secure supply must be playing an important role there. Yes, both in medicine and in autonomic driving we need networks that function permanently, without any failure. It will be a great challenge for us to create not only always faster and faster networks, but also to develop and guarantee extremely high-security standards. To provide networks which are always stable and accessible. These developments must happen parallel to the appearance of application possibilities. We can only market such things that are actually used. If the industry or the smart-city concept was not there yet, we would have to slow down the pace of our developments. However, this does not seem to be the case at the moment. We don’t need to worry about the parallel pace in the case of the 5G developments either. We are living in times when things are happening rapidly. 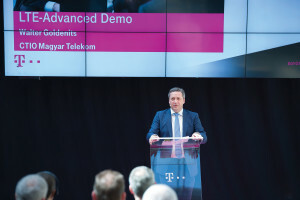 How far is Magyar Telekom concerning 5G? The first 5G applications will be happening in Europe in 2018. 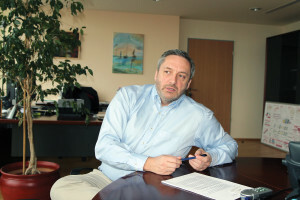 For Hungary I suppose that Magyar Telekom will be making its first pilots with 5G within the next two years. There will be a denser network. I don’t think that there will be many more masts than there are now. The topic of small cells will be much more actual, meaning mobile sending stations that are very small and can be installed in the house walls. 5G will bring a massive intensification in the use of small cells. We need more capacity and more accessibility. I suppose that in the next three or five years there will be about 2000 of these small cells built only in Budapest. How can you guarantee the uninterrupted availability? Magyar Telekom is working on this topic too. The keyword for this is preventive maintenance. We are trying to predict possible failures over Big-Data. If we know how the elements of our network are working and how high their chance to fail is, we can change the elements before an actual failure happens. Total failures can be prevented with the superimposition of networks too. When a network fails, another one takes over its activity without any delay. A third method is the clear definition of priorities, where in the case of emergency medical applications they are enjoying a higher priority than game applications, for example. Many of the solutions that will be acutely needed in the time of 5G can be already prepared today, in the time of 4G. How is the Pan-European network doing? The Pan-European network is an effort to synchronise certain things on the production and supply side. It allows to complete certain things that we otherwise would have to do 12 times, so separately for all the countries, where Telekom is present, just once. There are other advantages coming up too. We have already achieved that when you pass the border between Austria and the Czech Republic, your phone conversation is not interrupted. It used to be a constant problem for clients near the border that their conversations were interrupted. Now their connection is simply taken over by the stronger network without the client noticing anything happened. This will be the case everywhere in the future. Does Telekom own the largest homogenous network? Yes, at least in Central and Western Europe. For a potential client travelling a lot within this region we are the best option. The same is true for people living in the border regions. On the medium term the issue of roaming is out of question anyway, at least for the EU member states. The roaming fees are getting lower and lower already. However, in the EU-non-EU context roaming will be remaining. What is the role of television data supply in the operation of Magyar Telekom? TV is one of our flagship products. This is an area that we are planning to strongly develop in the future as well. Especially since interactions are going to play a greater role there too. The integration of devices is going to develop further as well. The TV screen is becoming more and more an interactive platform where you will be able to contact other devices and other people. The Smart Home concept is also part of this concept, which means the integration and steering of applications in connection with the security and management of a house. High transmission speed is necessary for that too, made possible via the fixed network. At the moment the network technology already allows the multiple of the speed of a normal laptop. In many parts of the country we are offering transmission speed that cannot be fully utilised by the users yet. However, there are areas where the transmission speed is under 30 megabits per second. There you need a combination of fixed and mobile network. At the moment the clients already have a very good internet experience for the majority. With a speed of 50 megabits per second nothing should stand in the way of having fun on the Internet. The difference between 50 Mbps and 100 Mbps is not even perceivable in the case of many applications. When you have an appliance with a lower performance, the performance curve will be sinking. Older appliances with an internet connection are only able to process two to three megabits per second. Purely in technical terms, how modern is the cable network of Magyar Telekom? Do you still have to invest a lot into glass fibre networks? At the moment we are making further investments into the development of our glass fibre network within the context of switching from copper wire to glass fibres. Once that will be completed, we won’t be changing much about the physical infrastructure in the next 10 to 15 years. One thing that will be changing significantly will be the network behind it, meaning the bandwidth, which will be increasing. By 2018 we would like to upgrade our fixed network completely and tune it up to a transmission speed of more than 30 megabits per second. How competitive is Hungary considering the mobile and fixed networks within your company group? Hungary is doing very well in this topic. Especially when it comes to the establishment of data-intensive investments, such as call centres or shared service centres, where Hungary is right at the top. Does Deutsche Telekom also have a shared service centre in Hungary? Yes, we have established a data centre in Hungary within the Pan European network project. This is one of our three locations in Europe, where we handle and store large quantities of data. Will it still be possible to fit the growing quantities of data from the more and more dense mobile networks in the atmosphere? Is there an upper limit before it comes to interferences or other disturbances? The smooth transmission of the expected data quantities and the capacity of the networks is absolutely guaranteed for the next 15 to 20 years. In the case of Internet of Things, which is coming up more and more, there will be many senders and receivers but only small data volumes. On the other hand, there will always be a user interface limitation for users on the road using mobile networks. Because of this and other circumstances, I suppose that all the applications planned today will be realisable as for mobile data transmission. Of course, there will always be extraordinary burdens, such as the hype with the Pokémon Go game last summer. The effect was extremely viral, the game was spreading at an extreme speed. Hundred thousands of 4G users were “hooked” within a couple weeks. We were able to experience what happens when an extreme data burden arrives from a single point from the network. The challenge for us was that we had to manage a large number of users moving large data quantities that appeared suddenly and which in addition were moving stochastically. So, what was only a game for most people was a huge challenging business case for you! Yes, we could learn from it how systems have to be developed in the future in order to create free capacity quickly, even in the mobile networks. So Pokémon Go was an “appetiser of the future”, a realistic look into what might happen there. It was very fascinating. When these kind of things will be applied in business life and used in an increasing extent, that’s when it will get really exciting. Since the question is, whether we will be ready with our adjustments quickly enough. However, I am certain that things are going very well. Did Magyar Telekom ever experience network outages due to Pokémon Go? No, our network was able to handle the extra load. What we experienced however was that the average bandwidth of the mobile networks decreased when there were many monster hunters on the way at the same time in the same cell. So we are back to the question of priorities. It has to be clarified exactly what the clients need. The fuller the air is with data, the greater the probability that someone wants to access this data in an unlawful way. How can you prevent the misuse of data? Deutsche Telekom is placing a huge emphasis on security measures. We don’t need to smooth talk about that. This is a real competition with criminal organisations and hackers, however we are trying to stay always one step before them. This is made more difficult by the fact that the sense of wrongdoing is still very badly developed over the internet. Invading the private sphere of a person or an organisation is regarded almost as a heroic act. Let’s take as an example how popular hackers are, since they hack governments, companies and institutions. Our security measures are very good however, and we are in intensive co-operation with the authorities, since the governments are also interested in keeping their data secure. However, we are constantly in competition with cyber-criminals. How satisfied are you with the relevant conditions of the national framework? The government can do a lot for data security. In practice you are trying to follow the regulations. It’s the government’s task to create the relevant framework but it’s not sufficient to stop cybercrimes. Companies such as Deutsche Telekom can achieve a lot with their own resources to make their customers feel safer. It is a continuous learning process as well. In principle we need more co-ordinated processes, where public authorities and private industry are working together for the security of the online world even more intensively. This topic is after all a threat to our dreams. In terms of security we have a lot more to do. The whole telecommunications industry is called upon to create standards and further arrangements. The hardware and software manufacturers have to make their contributions too. The whole system has to be homogenously secure. When a provider leaves a hole the security of the whole industry will be endangered. Data loss is throwing a bad light on the whole industry. The whole thing will be even more explosive, if criminal organisations had a chance to influence the democratic process. If events in the state administration could be manipulated, the whole thing is on a different level than as if “only” companies could be hurt. Awareness about data protection is becoming more important than ever for that reason too.